Our school is honored to receive Po Leung Kuk Outstanding School Award for the fourth time since the school’s establishment. Our school was honored to receive Po Leung Kuk Outstanding School Award in 2011, 2013, 2017 and 2018. Dr. Margaret W.L. CHOI, Chairman of Po Leung Kuk & Po Leung Kuk Schools’ Supervisors Committee is presenting Po Leung Kuk Outstanding School Award to our school representatives (Photo taken on May 17, 2018). PLK Laws Foundation College (LFC) was awarded PLK Outstanding School Award in 2011, 2013 and 2017. To recognise LFC students’ exceptional performances in academic and extra-curricular activities, the same award was given to LFC for the 4th time in 2018. In terms of public examination performance, both the overall passing rate (Level 3 or above) and credit-to-distinction rate (Level 5 or above) of LFC students were much higher than the Hong Kong average. In terms of value-added scores 2016-2017, LFC attained a Band Score of 7 or above (out of 9) in Best 5 subjects, Core 4 subjects, English Language, Mathematics (Compulsory part) and Liberal Studies, reflecting superb teaching qualities of the school. With an aim to instill well-roundedness in LFC students, they are constantly engaged in various HK-wide and International competitions. Academic-wise, LFC won the champion of the Speaking Contest for Hong Kong Students (English Section) for four consecutive years (2014-2015, 2015-2016, 2016-2017 and 2017-2018), and won many champions in Hong Kong Schools Speech Festival and other competitions. LFC students also actively participate in academic researches and international conferences. A space experiment designed by LFC students was carried to Space by Tiangong-2 in September, 2016. Thirteen LFC students published a scientific research paper which was accepted by Society for Neuroscience, Washington DC in June, 2017. LFC students also attended the 31st Youth Conference of Caretakers of the Environment International and the 4th Science and Conservation of Horseshoe Crabs Conference. Moreover, LFC was highly commended by the External Review Team of Education Bureau in 2016-2017. Three teachers received the Chief Executive’s Award for Teaching Excellence in the same academic year. LFC students attained significantly high credit-to-distinction rates in HKDSE. LFC students attained outstanding performances in many inter-school academic and sports competitions. LFC students presented their research findings in the annual meetings of Society for Neuroscience, USA. LFC students presented their research findings in the Youth Conference of Caretakers of the Environment International. Dr. Suen Ka-chun, Ms. Lin Mei-yu and Mr. Li Man-ho received Chief Executive’s Award for Teaching Excellence (Science Education) 2016/2017 on June 23, 2017. This award indicates that our science teachers demonstrate teaching excellence in the following 4 domains: Professional Competence, Student Development, Professionalism and Commitment to the Community. (iii) comprehensive curriculum plan for all students. 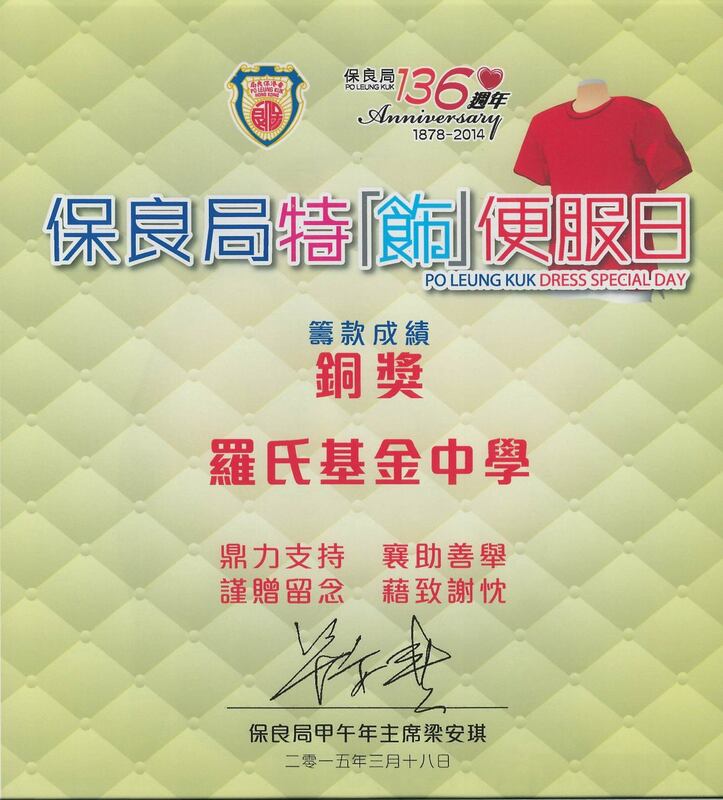 Our school is honored to receive Po Leung Kuk Outstanding School Award for the third time since the school’s establishment. Our school is honored to receive 2017 Po Leung Kuk Outstanding School Award. Miss Abbie S.K. 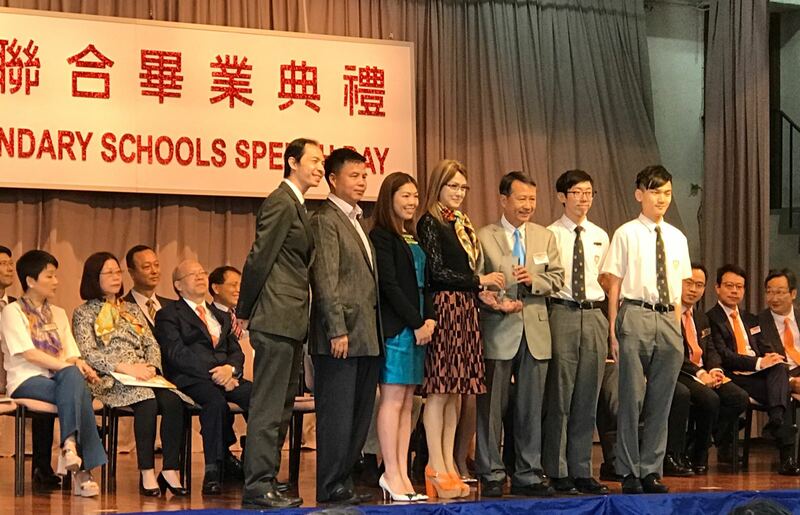 CHAN, Chairman of Po Leung Kuk & Po Leung Kuk Schools’ Supervisors Committee presented the award to our school representatives on Po Leung Kuk Joint Secondary Schools Speech Day on May 17, 2017. Miss Abbie S.K. CHAN, Chairman of Po Leung Kuk & Po Leung Kuk Schools’ Supervisors Committee is presenting Po Leung Kuk Outstanding School Award to our school representatives. LFC students received important prizes in the 30th China Adolescents Science and Technology Innovation Contest. LFC students’ experimental design about oscillation of a double pendulum was carried out in the space laboratory of Tiangong-2 spacecraft. LFC established DiagCor Biotechnology Laboratory and Law Cheuk Ecology Laboratory for promoting curriculum development. 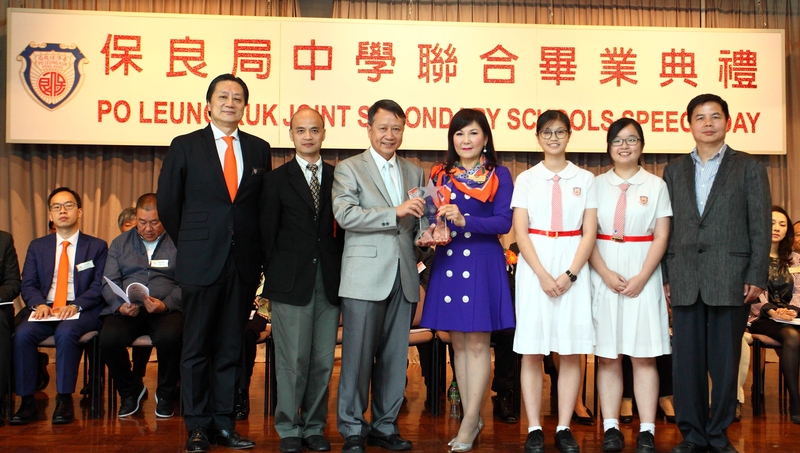 Our school is honored to receive 2013 Po Leung Kuk Outstanding School Award for the second time since the school's establishment. LFC attained outstanding public examination results in 2012 HKDSE. The average passing rate was 97.7%, whereas the average credit rate of Level 4 to Level 5** was 58.6%. In the past 2 years, the no. of S1 applications was more than 7 times of its school places, showing the community's recognition towards the school's effort. In addition to excellent academic achievements, LFC students also performed outstandingly in extra-curricular activities. LFC is highly appreciated by the general public and it has received many awards for its contributions in different areas.